Temporary air conditioning needs in factories, showrooms, warehouses and offices can be overcome with a new portable unit available from Kennards Hire. Described as the big bopper of portable air, this ducted air conditioner has a massive 16,800BTU / 4.9Kw capacity, available from a standard 10 amp supply. 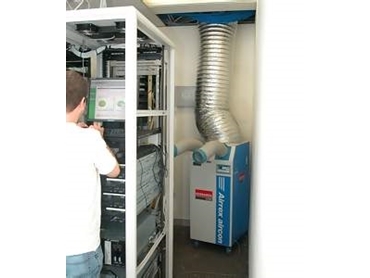 Kennards Hire, which has 92 locations across Australia, says ducted air conditioners are an ideal stop-gap, when permanent air conditioning breaks down or is off line for maintenance or other reasons. An area of up to 40 sq m is covered by cool air discharged from twin flexible outlets, which can be extended to eight metres. The operation is super quiet, and the only maintenance required is to empty a bucket of water each day. A unit is 1.6 metres high, 490mm wide, 590mm deep and weighs 86kg, with castors allowing easy movement.